Potting soil calculator allows you to measure the volume of soil needed for your container. Whether you want to have a raised bed in your garden or rearrange your blooming balcony, use the calculator to estimate how much soil you need to prepare. Choose between three types of containers, calculate your needs and go gardening! If you want to estimate the weight or cost of topsoil, use our soil calculator. Choose the shape of the container. In our case, it's a flower pot, so we need to calculate the volume of truncated cone. Enter the dimensions. For example, assume we have pots with the diameter across top equal to 4 inches, bottom base diameter of 3.2" and height of 2.75". Don't forget that you can select different units, such as centimeter, feet etc. Set the quantity of the flower pots. We want to plant oregano, basil, and thyme, so we need to put three in the quantity field. The volume of soil required is equal to displayed value. 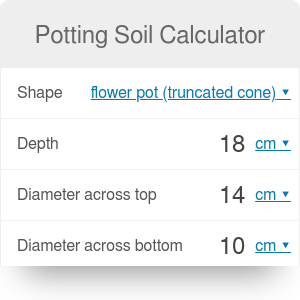 Our calculator is a flexible tool, so you can calculate everything the other way round: if you have a bag of soil and size of your containers, you can estimate how many pots can be filled. Remember that obtained result represents the volume for the full container. Sometimes you want to fill the container to 4/5, or you already have a plant or tree with the roots and then you will need less soil. The amount of soil may also change as you squeeze it or leave it looser, so presented calculations are only a good estimator. Potting Soil Calculator can be embedded on your website to enrich the content you wrote and make it easier for your visitors to understand your message.